The 2690 acre Urbana State Forest is located five miles north of the village of Hammondsport. The forest is located in the towns of Urbana, Pulteney, and Wheeler in Steuben County. Recreational opportunities in this state forest focus on rustic experiences with a limited amount of development. The Bristol Hills Trail provides good access to the interior of the forest. This trail is a branch of the 900+ mile Finger Lakes Trail System. A short loop trail also gives access to Huckleberry Bog. Huckleberry Bog is a wetland which supports Highbush Blueberry and a variety of other heath type plants. An interpretive brochure is available, on-site, for this area. We've included a couple of popular loop hikes in this state forest. The Urbana Bog Nature Trail Loop takes you on a 4.3 mile hike past the large Evangeline Shelter with its loft, fireplace and camping area as well as the restored Covell Cemetery, Huckleberry Bog and Bog Observation Deck. 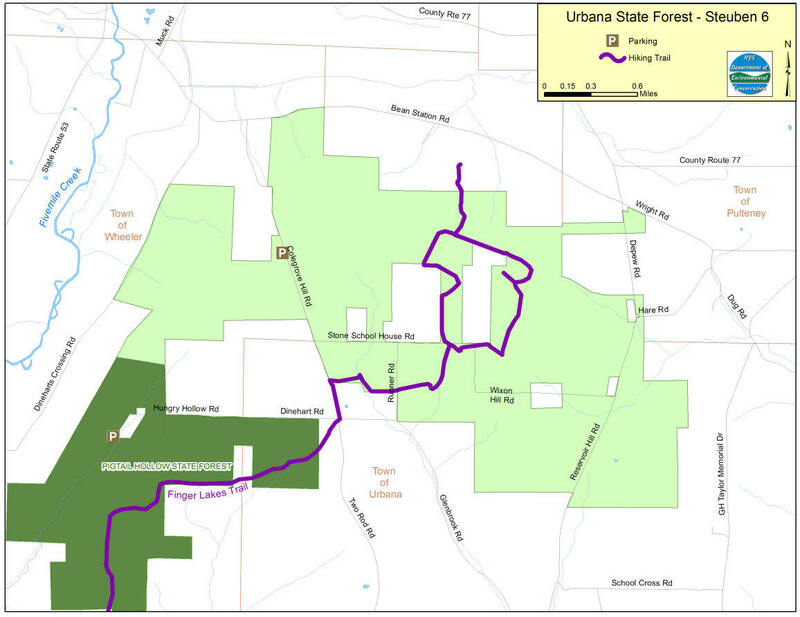 The Urbana State Forest Loop is 5.4 miles and utilizes seasonal roads as well as the Bristol Hill Trail and a small part of the State Forest Nature Trail. This hike starts at the DEC Parking Area located on Colegrove Hill Road.